In recent years I’ve had increasing trouble with cold fingers. In winter I’ve gone from warmer gloves to mittens to expedition mittens. After even brief exposure to the cold, the circulation in my fingers shuts down and they go scarily white. On winter hikes I carry chemical handwarmers not just for comfort but as an emergency measure, because if anything went wrong and I had to stop moving I’d be highly vulnerable to frostbite. Finally I learned that the condition has a name: Raynaud’s syndrome. The Mayo Clinic says it’s more a nuisance than a liability, and I guess that’s true, but lately it’s gotten to be a real nuisance. Even indoors, during winter, I’ll realize that my hands are ice cold, and have to run hot water on them in order to resume typing on the keyboard or playing guitar. I read that some folks have had success with biofeedback so I decided to give it a try. Raynaud’s is just an autonomic nervous response. The shutdown of circulation to hands and feet may be necessary in a survival situation, but with Raynaud’s it happens unnecessarily and inappropriately. The idea of biofeedback is that you can train yourself not to do that. So I got one of these. 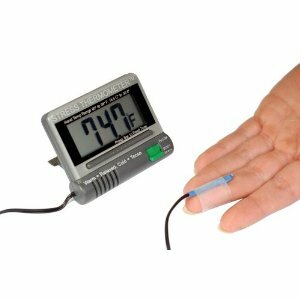 It’s nothing special, just a thermometer with a sensor you tape to your finger. You look at the number and try to make it go up. The first few times I tried nothing happened. The baseline, for me, seems to be room temperature, which in winter might only be mid-60s. I couldn’t budge from that. Then, one day, after about 15 minutes, I gained a tenth of a degree. Then another. Then a degree. Then another. And suddenly the temp was shooting up. In about five minutes it went from 67 to 94. This wasn’t replicable. Sometimes I’d get that dramatic response, sometimes nothing at all. And it didn’t seem very practical because you can’t do anything else, you have to watch the readout — this is biofeedback, after all. Eventually I noticed that if I placed my opposite hand — that is, the one without the thermometer — someplace warm, like on my neck, then I could sometimes trigger the warming response in the other hand. So that’s my current best strategy. When I notice my hands feeling cold indoors, I’ll take a “measurement” by placing one hand lightly on the side of my neck. Often I can get both hands to warm up by doing that. I think the thermometer was useful mainly to prove to myself that the relaxation response is controllable. And that it’s binary, or so it seems to me, by which I mean that for the most part it either happens or it doesn’t. And that some kind of feedback is needed to produce the warming effect I want. Direct self-measurement (i.e. touching my neck) seems to work well enough, and that’s nice because it’s something I can easily do while working. I’m getting OK results indoors, but still not having much luck outdoors. Now that I know the syndrome isn’t just something that happens to me, though, but rather something I’m doing to myself, I think I might eventually be able to back off from the arctic mittens on days other people are wearing light gloves or nothing. Author Jon UdellPosted on 28 Mar 2012 28 Mar 2012 Categories . I’m a kayak coach and have noticed many times that I start out on a cold day and get water on my hands it really hurts at first. After about 15 minutes something happens and my hands stop hurting and feeling cold. It sounds like the automatic response you’re talking about. I don’t have Raynaud’s but it does seem I’ve trained my body to sort out the temperature problem. Could be. I’ve read somewhere that sometimes this counter-intuitive strategy does work.